You sink up to your knees in the mud, not thinking that the bottom of the lake doesn’t offer solid footing. Now you’re cursing like a sailor, wondering how the hell you’re going to get yourself out of this mess of what was supposed to be a fun day of fly fishing. So what’s the best way to fish a lake, you ask?! You’re completely mobile on a float tube. You can reach ANY part of the lake that you want to get to. You don’t have to worry about getting stuck in the mud or going for a swim if you step off a ledge in water that’s not clear enough to see the bottom. You can cast towards the bank and pull streamers away from the bank. You can position yourself so that it’s easier to cast in the “W”. And by “W”, I mean WIND!! You can fish lakes and ponds during runoff and avoid trying to fish murky water and sometimes dangerous wading in high water. It’s fun! 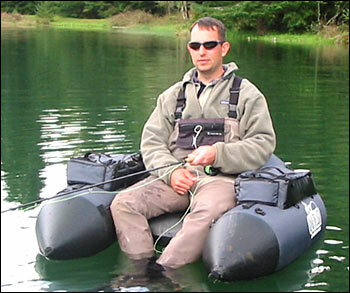 Floating around on a lake in your float tube is a hell of a good time, and really adds a whole new element to fly fishing. To top it all off, float tubes are pretty damn cheap. I think I got mine on sale at Cabela’s for $100 bucks a few years ago. Check out what Cabela’s offers HERE. Get out there and fish those lakes while the rivers are swelling and maximize your fish bounty!